This family came to us with a simple goal: incorporate an inground pool into the existing natural landscape of their Baldwin home. Our design team met with them to come up with a customized solution to give this family of five an exceptional solution to a straightforward goal. When we visited the site outside of Baltimore, we were thrilled to find an existing blue stone patio, and incorporated this beautiful hardscape material into the coping that borders the pool at the same elevation of the patio. Our Woodfield designers selected a dark Pebble Tec Pool Finish; we love working with this luxurious, durable finish on all kinds of pool and spa installations. Inspired by the natural brilliance of riverbeds, Pebble Tec finishes are available in a wide variety of colorways, integrating specially selected pebbles from around the world with a specially formulated cement that gives an enduring brilliance both to new pools and as a resurfacing option for pool updates. To ensure ease of maintenance for years to come, a channel drain will be installed between the patio and coping; we selected 3” PVC pipe feeling confident it will catch any water from the patio. The channel drain will prevent pooling on the patio, protecting the beautiful blue stone and allowing the family to enjoy their patio every day of the summer. 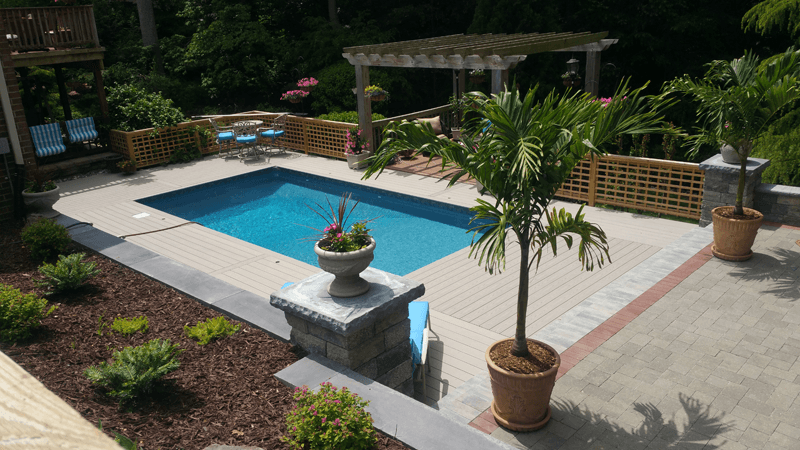 Although the pool install was meant to enhance the homeowner’s enjoyment of their outdoor living space in the summer months, they also wanted to add a spa for year round use. A matching spa, installed with a Pentair variable speed pump heater and filter was selected to integrate into the design and offer precision and savings. The Pentair pump offers energy savings in a power, quiet, and dependable pool pump that operates consistently throughout the season. 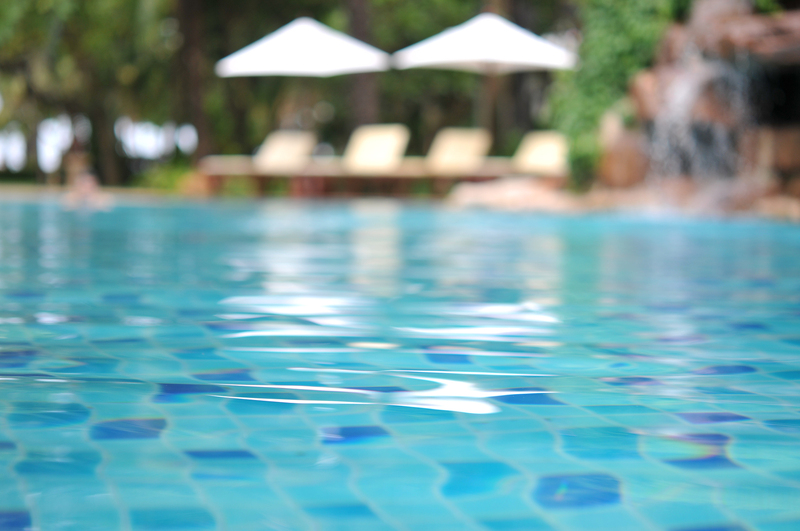 The use of germicidal UV light will allow the spa to be sanitized with very little Chlorine. This means less active maintenance for the owners, and less exposure to chlorine by-products. A Pentair Intellitouch control system will give them the flexibility to easily manage the spa’s lights, temperature, and the force of the jets, either though a simple panel or convenient mobile app that can be accessed by smartphone or tablet. The blue stone patio was in great shape, but in order to restore it we will grind out the joints and install new mortar. These simple adjustments will add another 20 years of life to the patio. That is the beauty of using natural products. They last forever with a little maintenance. One of the challenges of the existing landscape was a steep slope on the north side of the pool site. Of course we wanted to maintain some of the usable space in the yard for the kids to throw the frisbee and to take advantage of the great sun exposure for a summer’s worth of tomatoes grown in the container garden. A segmented retaining wall will be installed to stabilize the slope and incorporate a flat, grassy area between the pool and wall. A blue stone cap will top the wall and echo the design of the patio and pool coping. This project is now in the hands of our Woodfield crew, who will carefully execute the designer’s vision and bring the family’s concept to life in time for summer. You can REQUEST A FREE ESTIMATE to start a conversation with our design team. All pool installations scheduled prior to Memorial Day are eligible for a Pentair Pool Upgrade.